+1 on the steering rack. The rack has the same ratio as non-ZHP. Read my above post. It has the same BMW part number but a different one from ZF. It is again up for debate. I always thought/heard that the zhp and competition option M3's came with the CSL steering rack. 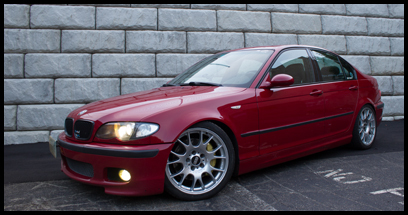 The way the steering felt was the third thing that really impressed me about my ZHP. The first was the exhaust note as the PO pulled into the parking lot to meet me, the second was how the fuzzy seat hugged me when I sat in it. I still love all of those, but I am really glad the steering is the way it is cause that was a source of contention for me and my previous car. Was this after the end of sedan production? I've never seen a zhp sedan with a perforated wheel. Correct. Last month of production for the sedans was 1/05 in the US and 2/05 in Europe. If this was already posted I apologize and it can be removed. I looked and didnt see it, but could just be lack of sleep. M Badging on top of the 6-speed short throw weighted shifter. Clear turn signals to include headlights, side-markers, and tail-lights instead of the standard amber markers. Instrument gauge cluster was modified with red needles and polished metal trim rings. I am going to ad to this tomorrow, if anyone sees anything I missed or that is incorrect I will adjust it. It should be noted that the suspension in reality was no different from SP. Aside from bigger/stronger control arms. Just an anecdotal comment on the steering [rack]: My friend, to whom I sold my E36M3, when taking my ZHP for a spin, was surprised by the (as he put it) 'go-cart like' steering as compared to the E36. Irrespective, our cars, whether or not having the same steering rack as other performance E46 models, do exhibit really sharp steering response.